For Immediate Release: Posted On 9/26/2017 By Industrial Magnetics, Inc.
Industrial Magnetics, Inc. (IMI) of Boyne City, MI recently announced attaining an important milestone in their production capabilities for large, cross-belt, electromagnetic separators. With the use of a new crane bay, the company was able to manufacture and ship a 20,143 lb. suspended magnetic separator. According to IMI, the magnetic separator, measuring 139” x 72” x 38”, will not hold the record for long. Already in the works is a 27,199 lb. magnet, that will measure 128” long x 84” wide x 42” high. These large, electromagnetic separators are used to remove tramp metal from conveyed product in industries such as Mining, Aggregate, Recycling, Tire Shredding, Foundry, Wood Chip, Pulp & Paper, Power Generation, and Construction and Demolition. 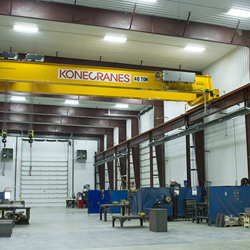 The crane, manufactured by Konecranes, is capable of handling up to 40 tons and is integrated with a special loading bay for handling the large trucks required for shipping. For more information on IMI’s manufacturing capabilities for electromagnetic separators, please contact IMI’s Tramp Metal Group at 888.582.0821.